There is a famous market in Seoul called “Gwang-jang market (광장시장)”. 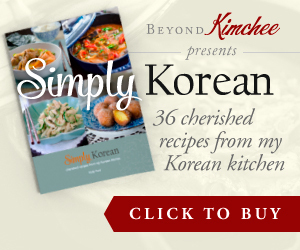 You can find all sorts of items that are related to the food. I personally have never been there, so I can’t tell you much about it. 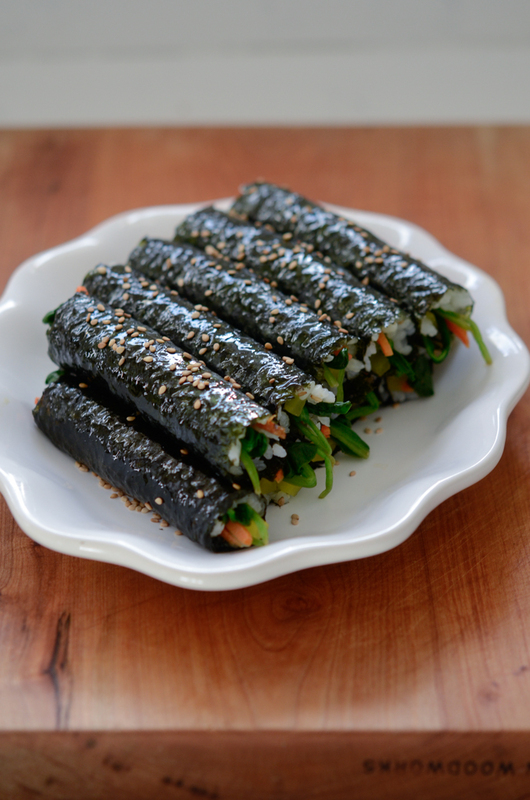 However one of the famous food from the Gwang-jang market is this mini seaweed rice rolls called “Mayak Gimbap (마약김밥)”. Mayak means narcotic. They named it narcotic because these little mini rolls are so addictive once you taste them. 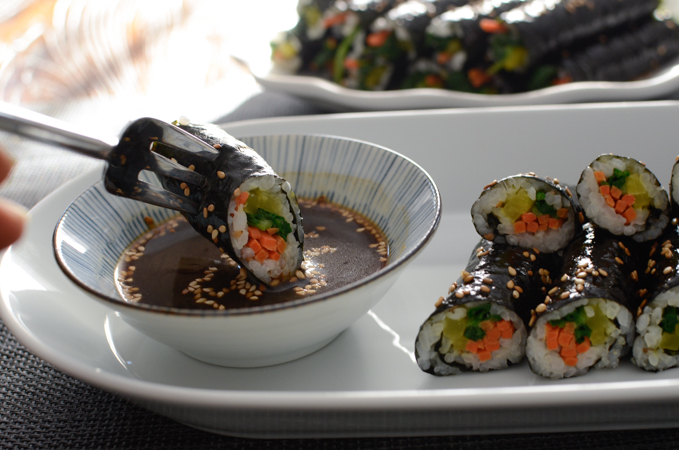 Mayak Gimbap is mini seaweed rice rolls served with soy sauce & wasabi (or mustard) dipping sauce. 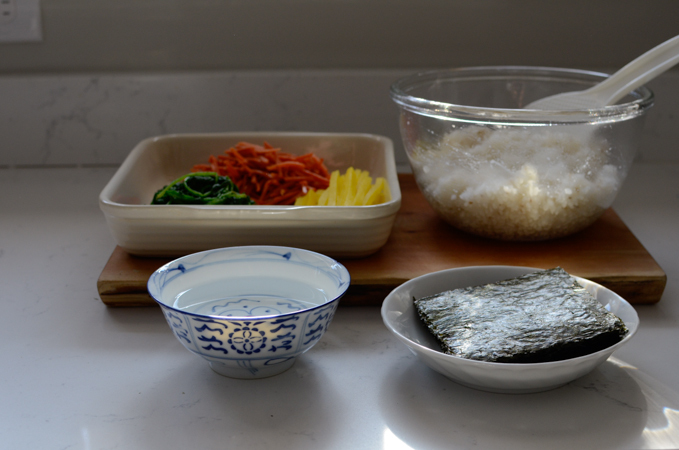 These little rice rolls are far easier to make than traditional Gimbap. 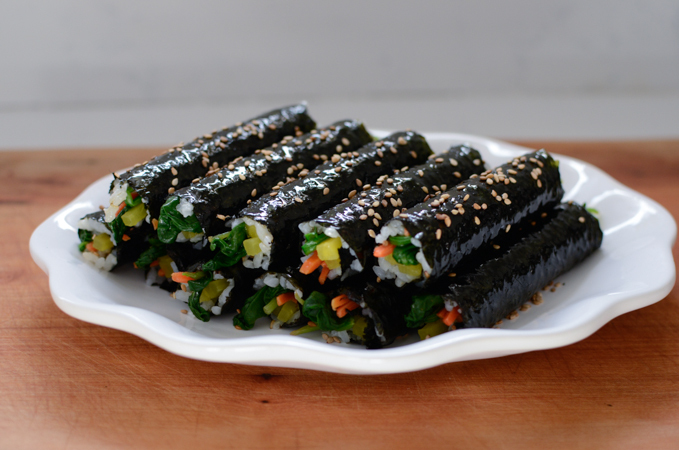 You only need 3 different vegetables to fill in instead of 6-8 in the traditional rolls. You don’t need the bamboo tool to roll them up either. It is easy to make, tastes addictive, and fun to dip in the sauce. You will need 3 vegetables contrasting in colors for the look. 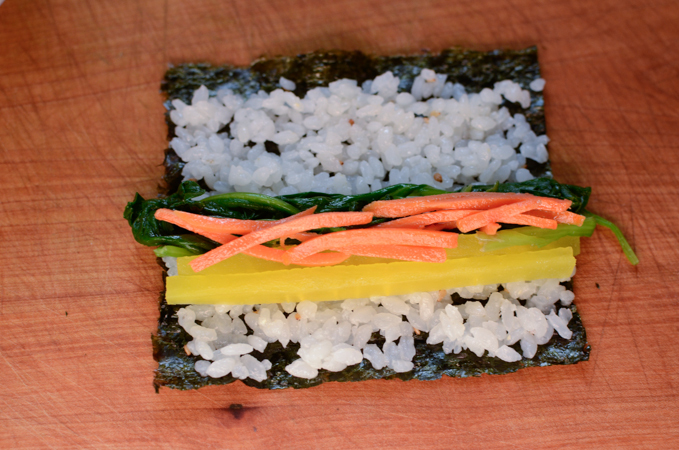 Sliced carrots, spinach, and pickled radish (danmooji, 단무지). For carrots, I used store bouth pre-sliced carrots and cook in the skillet with a little bit of oil and salt. The trick to cook this faster is to add a little bit of water to get the steam going and cover with lid for 1-2 minutes as you cook. 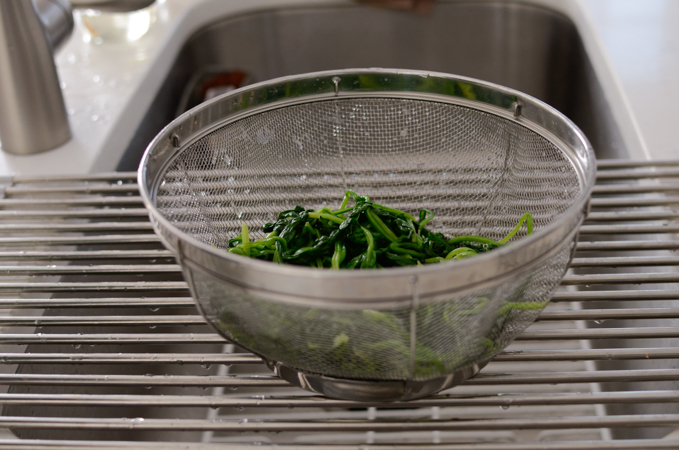 For the spinach, blanch them in the boiling water for 10 seconds. Drain and rinse under cold water, squeeze out to remove excess moisture. Then season with a little bit of soy sauce. That’s it! For the pickled radish, Cut in half lengthwise, then slice into thin match sticks. Season the rice with a little bit of salt, sesame oil, and sesame seeds. It makes much more flavorful. Quarter the sheet of seaweed like that with a pair of scissor. Now you are ready to roll up. Prepare a bow of water to dip your fingers occasionally. That will help so the rice won’t stick to your fingers. 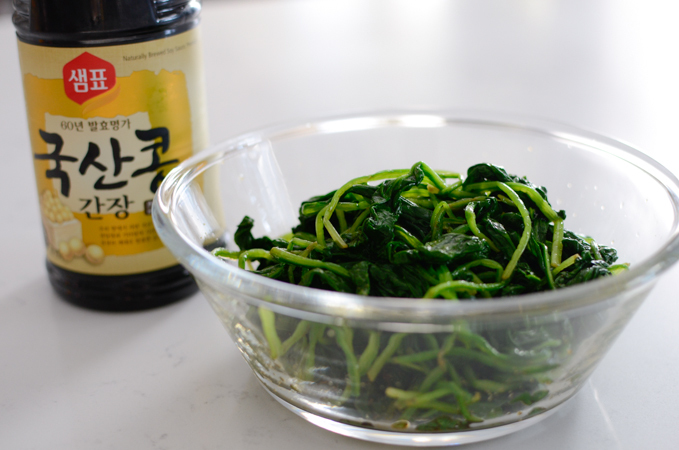 Spread about a tablespoon of rice onto the seaweed and top with vegetables. Try not to put too much of each. Otherwise it will be difficult to roll and secure the edge. Brush with a tiny bit of sesame oil over the rolls. I like to use a plastic glove to apply the oil instead of using brush. Sprinkle some toasted sesame seeds. They look fantastic, right? For the dipping sauce, mix soy sauce, vinegar, sugar, wasabi (or dijon mustard), and a little bit of water. I like to cut the mini rolls in half diagonally. And serve in a pretty platter with the dipping sauce. Dip the rolls in the sauce and savor all the flavors inside your mouth. So good~! You can literally eat a dozen rolls in no time. 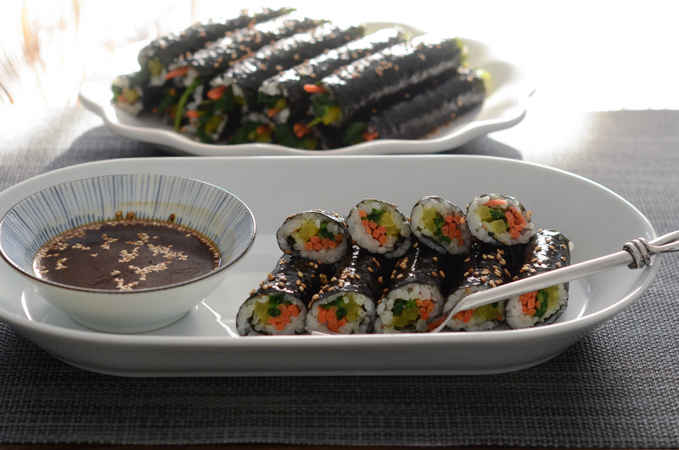 Mayak Gimbap will be great for picnic food, too. 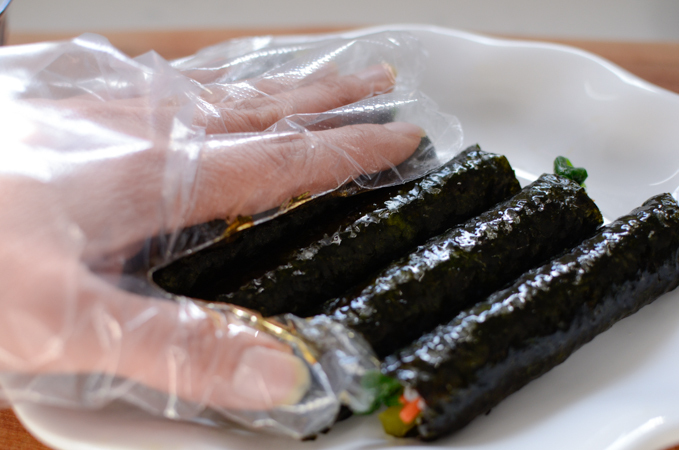 So when the weather turns warm and the sun is shinning, make these mini rice rolls and take with you wherever you go. Everyone would be jealous and might beg you to try one. I also just realized that these rolls make perfect vegetarian/vegan as well as gluten-free dish if using gluten-free soy sauce. How nice? For the carrot, heat oil in a skillet over med-high heat. 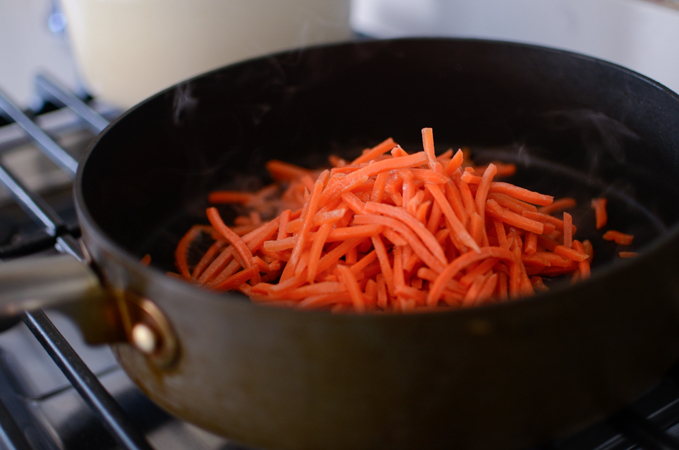 Cook carrots, adding 1 tablespoon of water to create steam. Cover with a lid and cook for 30 seconds. Continue to cook to soften the carrots, adding more water if needed. Season with a little bit of salt. Set aside to cool. 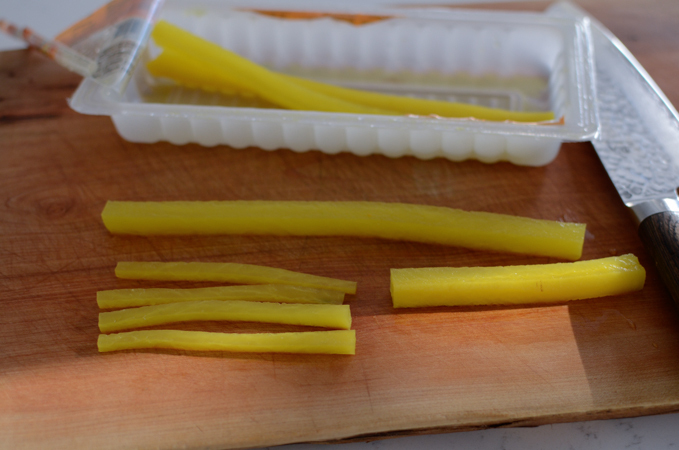 For the pickled radish, cut the strips in half lengthwise, the slice each strips into 1/4 thickness. Set aside. For the spinach, season the blanched spinach with soy sauce. Toss well and set aside. 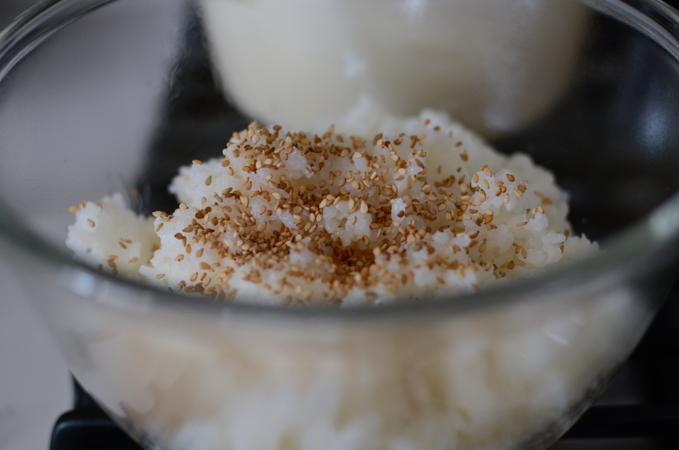 For the rice, season the rice with sesame oil, salt, and sesame seeds. Mix well. To assemble; quarter the gim sheets so that you have total 20 mini sheets. Top with carrot slices, spinach, and 1-2 strips of pickled radish. Roll it up tightly. Repeat the other sheets until you finish them all. 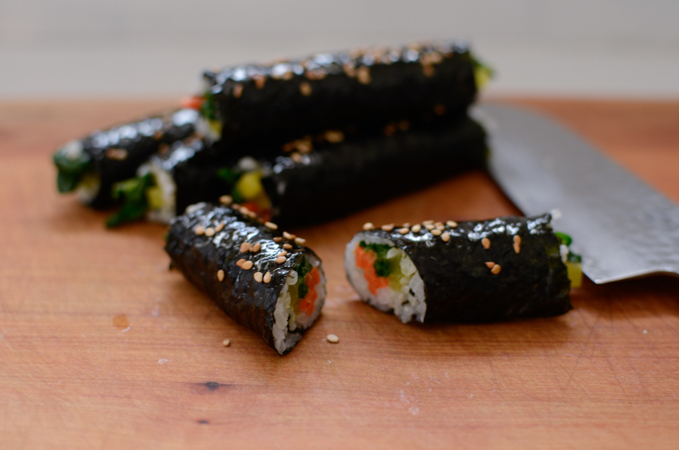 Brush the rolls with a little amount of sesame oil and sprinkle with toasted sesame seeds. Cut the rolls in half, if you prefer, and serve with dipping sauce. 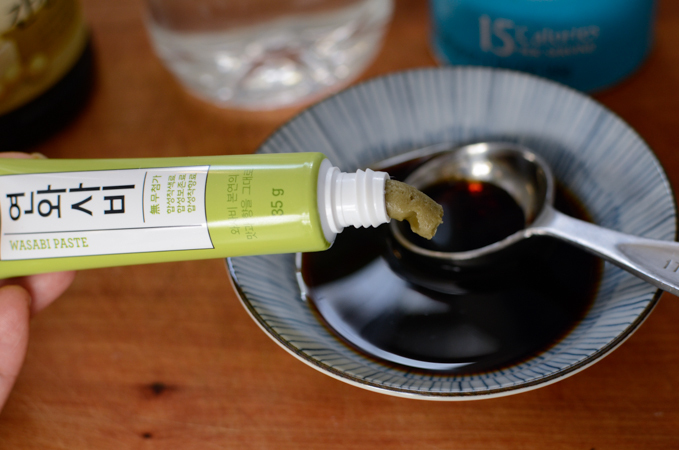 To make the dipping sauce, combine all the ingredients and mix well. 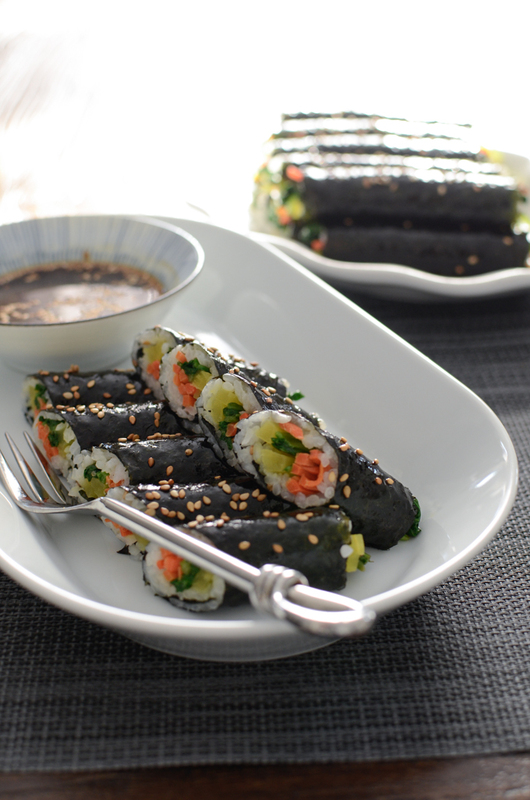 I love these - I have neither temper nor patience to make proper looking maki or gimbap. These will do fine for me. 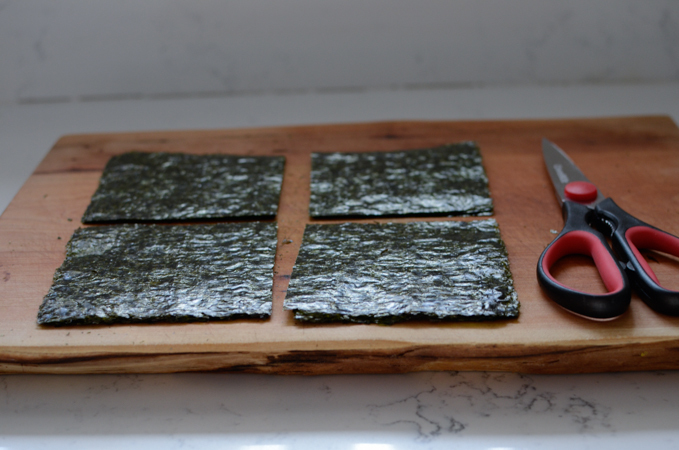 I suppose making them for bento/lunch box is not a divine idea as the nori willl get soaked? Susanne, They will be great for lunch box. 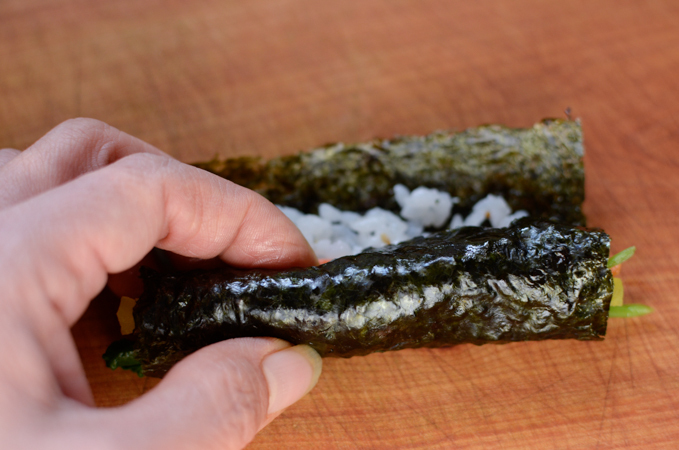 The seaweed will get somewhat soft but not soggy since it is brushed with oil. I often make these rolls for my kid's lunch box. Oo oo these look so good! How much sesame oil, salt and sesame seeds would you mix in the rice? Thank you! 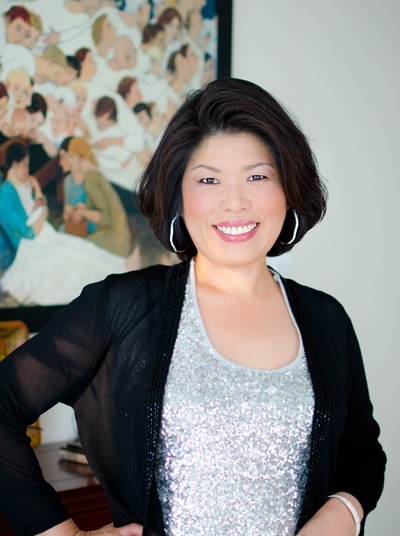 How much salt, sesame oil, sesame seeds did you use to flavor the rice? Thank you! 2 teaspoons of sesame oil, 2-3 pinches salt to flavor the rice. oh my goodness. I have to give this a try one day! Looks so good! We love nori a lot! Please, do. You gonna like it.